Whether you have the budget to buy full mass booklets or to create your own, make sure that you spend time preparing your wedding mass. Choosing readings and prayers that appeal to you will make the mass really special for everyone. Consult with your Priest throughout the process as each Priest and Diocese can have different opinions. They will make sure that you have everything in the right order too. If you need to save on space there are some parts of the mass that only the names/headings can be put in – this would need to be discussed with your Priest. Below you will find a list of our mass booklet options. 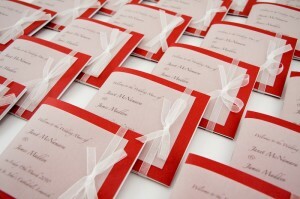 Each can be customised to match your stationery designs at no extra cost. All of our Mass booklets are printed on high quality metallic paper and card.